score 1,000 points and have 500 assists in his career. East Stroudsburg University’s senior guard Matt Tobin accomplished something no other Warrior has before—he became a 1,000-point scorer and has 500 assists. The feat happened in front of the Warrior faithful at Koehler Fieldhouse as ESU got back on track with a 91-73 victory over Cheyney in a Pennsylvania State Athletic Conference East matchup Saturday night. In a game where the Warriors were in control from the opening tip-off, Tobin became the twenty-seventh 1,000-point scorer in ESU history after finding the bottom of the bucket on a three-pointer to put the Warriors up 25-19 with seven minutes left in the first half. The Hopatcong, New Jersey native also became the eleventh player in PSAC history to have 500 assists to go along with his 1,000 career points. Tobin’s 518 career assists is a school record. He also leads the PSAC with 6.3 assists per game. Tobin, who finished the night with 7 points and 5 assists, is the first player since Adam Kaufman of Edinboro (1997-01) to join the group of now eleven members which was first started when Lee Felsburg (Mansfield 1963-66) accomplished the feat for the first time in PSAC history. Tobin and senior guard Whis Grant, who is second all-time in scoring in ESU history, became just the third pair of classmates to eclipse the 1,000-career point mark in the Warriors’ program. Most recently, Duane Johnson and Terrance King both reached the milestone during their playing careers from 2009-2013. In recognition of his achievements, it was announced that Matt Tobin has been named the Lehigh Valley Small College Basketball Organization’s Pete Nevins Player of the Year for the second year in a row. In 2007, the Player of the Year award was renamed in honor of Pete Nevins, who served as ESU’s sports information director from 1969 to 2002. As for the game, the Warriors’ offense returned to their form during their season-high six-game winning streak as they shot 50% (16-for-32) from the floor in the first half and 41% (17-for-42) in the second half to take care of the Wolves and keep a 1.5-game divisional lead in the standings over the Kutztown Golden Bears in the PSAC East Division. In the win, ESU’s offense was led by sophomore forward Rasheed Moore with 16 points. ESU also had ten different scorers with at least 5 points and three double-digit scorers along with Moore in redshirt senior guard Will Brown (14), junior guard Jamal Nwaniemeka (11) and redshirt senior guard Muhamadou Kaba (11). The victory also extends the Warriors’ streak to ten consecutive seasons with 16 wins or more, which is the longest current streak in the PSAC. 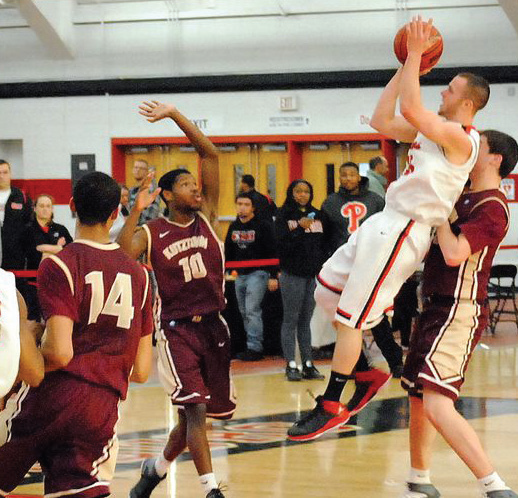 On Wednesday night, February 18, ESU beat West Chester, 82-76. The win gives the Warriors at least a share of the PSAC East regular season title for the third straight year. Tobin led ESU again with 22 points and 7 assists.